Planning to sell your home soon? That's good news, because the odds are good that you'll be trying to move your home in a seller's market — one in which demand for homes outpaces the supply. But just because demand might be higher this spring doesn't mean that there won't still be challenges to selling. The price you set remains critically important. So does staging your home so that it looks its best. Selling a home in a seller's market means that you might be fortunate enough to receive multiple offers. This also means that you'll have to decide which offer is best — not always an easy task — and that you might need to move quickly. You may even have to rent a space to live while you search for your next home. 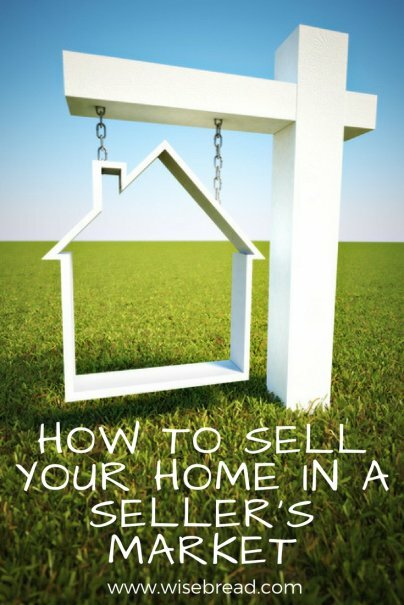 Yes, selling a home in a seller's market is preferable to doing so in a buyer's market. But you'll still need to take certain steps to succeed. Listing your home at the right price is still key for selling quickly, even in a seller's market. Just because the market is hot doesn't mean that buyers will rush to pay more than fair value for your home. Setting a price that's too high could mean that your house will sit on the market for months, even as your neighbors' properties are snapped up. If you are working with a realtor, they will study what are known as comparables, or comps; these are the sales of similar homes in your neighborhood. Your agent will show these comparable sales to you, along with the range of prices that these homes sold for. Maybe five homes similar to yours sold in the last month. The lowest price fetched by these homes might have been $200,000, while the highest might have been $285,000. From this information, you can determine that your home's asking price should fall somewhere in that same range. Where exactly it falls depends on several factors: How old is your home? Has its kitchen or bathrooms been renovated? Does it have a larger yard? Does it sit on a busy street or a quiet side avenue? How well have you maintained it over the years? Pricing at the higher end of the scale can work in a seller's market, as buyers don't have quite as many options. You might be able to squeeze out a few extra dollars in profits. Maybe you priced your home at the top of its feasible range. But now you're not getting any offers. It might be time to drop your price. Lowering your price could bring a new flurry of activity to your home, and might be the key to finally getting an offer. This is especially true in a seller's market, where there are plenty of buyers touring a limited number of properties. You might lose some profit by selling at a lower price. But that lower price will attract more showings and more offers. You might even see a bidding war develop for your home, with more than one buyer attempting to snag it. Staging a home — removing excess clutter, rearranging furniture so that rooms look bright and spacious — will provide the best first impression for buyers. You might think that this isn't as important in a hot market, but bad first impressions hurt, even when sellers don't have as many options to choose from. The absolute best result when selling a home is to receive more than one offer. If you're fortunate, you'll get into a bidding war in which multiple sellers try to outbid each other to win your home. But handling a bidding war and multiple offers does take some skill. You'll have to work with your real estate agent to make counteroffers and to determine which offer is the best. Say you receive three offers. You can counteroffer with all three potential buyers, hoping that your final sales price goes even higher. Of course, you run the risk of turning buyers away if you try to get that price too high. You'll eventually have to determine which offer to accept. You might think that the highest offer is automatically the best, but this isn't necessarily the case. Maybe the highest offer you receive comes from buyers who haven't even been approved for a mortgage yet. You might accept their offer only to see your sale scuttled when they don't qualify. Or maybe one set of buyers is offering more money, but also needs you to move quickly. The money you spend renting a place to live while you are closing on your new home might be higher than the extra money these buyers are offering. Consider all factors when juggling multiple offers: the price being offered, the strength of the borrowers, and any additional requests that potential buyers are making. You might sell your home more quickly than you'd expect in a seller's market. This means that you might have to move more quickly than you had anticipated. You may be able to negotiate a later move-out date, but some buyers need to be in their new homes by a certain day. If you don't want to lose those buyers, be prepared to move earlier than expected. This means paying for a short-term rental while you look for your new home, or staying with friends or family. You'll have to decide whether the inconvenience of renting outweighs the possibility of losing out on a potential sale.